Love it or hate it, brandy butter is an integral part of yuletide indulgence. With its clotted cream consistency and heady liquor flavour, it's the cherry on the cake of the Christmas lunch. The lingering last mouthful, which often tips the unsuspecting diner into a post-lunch stupor. Brandy butter – or "hard sauce" as it's less-romantically called in the States – is a rare ingredient not to feature in the culinary bible that is Larousse Gastronomique. The French seem to wash their hands altogether of this "deconstructed sponge cake", which only makes it as far as creaming together butter and sugar. No wonder brandy butter is a once-a-year kind of condiment. The consistency of brandy butter ranges from being quite thick and spreadable, to having being a little looser so it can be flicked from a spoon onto a steaming Christmas pudding. Be sure not to confuse it with brandy sauce, which is another thing altogether and has a custard-like texture. Whether it's slipped under the lid of a mince pie or melting down the sides of a figgy pudding, brandy butter is the pearly king of condiments, and an essential addition to the traditional Christmas spread. The essential brandy butter recipe involves creaming together butter and sugar, and then adding a slosh of brandy. There's little scope for error, though over-whipping the brandy butter can make it oily, and adding lots of brandy too quickly might make it curdle. Cream together 150g of icing sugar and 150g of room temperature butter. Add 2 tbsp of brandy, to taste, and serve. The Sugar: There's no right or wrong sugar to use – it depends on what you like. Smooth like fudge, or grainy like tablet? If it's the former, then icing sugar creates a buttery-smooth consistency, while caster sugar gives the brandy butter a more granular texture. Another common twist is to substitute in a little soft brown sugar or muscavado for both colour and taste. For a more maverick brandy butter, experiment by ditching the sugar and adding salted caramel instead. The brandy butter connoisseur might accuse a basic recipe of being quite bland except for the big whack of brandy. The addition of a couple of Christmassy extras can really elevate a brandy butter though. A little orange zest, grated nutmeg, dash of cinnamon or vanilla all make welcome additions. 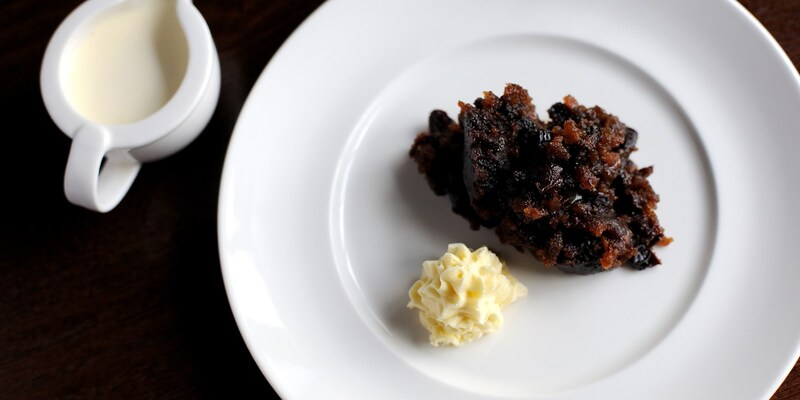 Try Dominic Chapman's luxurious Christmas pudding with brandy butter.